The denial will leave it to the courts to decide the scope of Congress’s power to demand records from a sitting president. The Treasury Department will not turn over President Donald Trump's tax returns by a Wednesday deadline set by House Ways and Means Committee Chairman Richard Neal and will consult with the Justice Department on the request, Treasury Secretary Steven Mnuchin said tonight. The Trump administration is poised to formally reject House Democrats’ bid to seize the president’s tax returns, setting up an epic legal battle that could rise all the way to the Supreme Court. The expected denial, foreshadowed by Trump on Wednesday, would leave it to the courts to decide the scope of Congress’s power to demand records from a sitting president. The rejection also ensures the matter will remain a prominent issue throughout much of Trump's third year in office as 2020 Democratic candidates hammer Trump over broken promises and many release their own returns. House Ways and Means Committee Chairman Richard Neal (D-Mass. ), who is spearheading the effort to extract Trump's returns from the Internal Revenue Service, declined to comment after Trump scoffed at his request. Democrats have made clear they intend to force the issue, though they have not spelled out their legal strategy. Before leaving for a trip to Texas, Trump said: “I won’t do it” because he said he is being audited by the IRS. He also said voters aren’t interested: “I got elected last time — the same exact issue, with same intensity, which wasn’t very much because, frankly, the people don’t care,” he told reporters. The Treasury Department has not formally responded to Neal’s request, which gave the administration until Wednesday to hand over six years' worth of Trump’s personal and business tax filings. An agency spokesperson did not respond to requests for comment. Denial of the request would mark the administration's latest snub of House Democrats who are intent on using their oversight authority to investigate large swaths of the administration and, in some cases, Trump's personal and business activities. Neal is relying on an arcane law that allows the head of Congress’s tax committees to examine anyone’s confidential tax information. It says that the Treasury secretary "shall furnish such committee with any return or return information specified in such request." A Trump lawyer, William Consovoy, has urged Treasury to reject the inquiry, saying lawmakers need a legitimate legislative reason to see the returns. Some, though not all, legal experts agree, saying the courts have put limits on lawmakers’ investigative powers. It will likely take months, at a minimum, for the legal system to sort it out, potentially pushing the issue beyond the 2020 election and spoiling Democrats' hopes of highlighting in the campaign any irregularities — or worse — they find in the returns. “It’s obviously a big case, so I would think a court is going to want to take its time and think through the issues pretty carefully,” said Hungar, now a partner at the law firm Gibson, Dunn & Crutcher LLP. Democrats want Trump’s returns to help answer a long list of questions about his finances, from how much he pays in taxes to his connections to Russia. But Democrats also say they have a sound policy reason to get the returns, arguing they need to be able to vet the IRS’s audits of the president. The agency has a policy dating to the 1970s of auditing every president, though Democrats say they know little about how those examinations work, including how rigorous they are or if they even really happen. They point to an episode from the Nixon administration when the IRS initially blessed President Nixon’s tax returns only to backpedal when a subsequent audit by Congress’s Joint Committee on Taxation found he actually owed almost $500,000. Republicans call that eyewash, saying Democrats are less concerned with overseeing IRS audits than with having an opportunity to search for things in Trump’s taxes they could use to embarrass him. They also warn that forcing him to give up his tax information could spur retaliation by Republicans seeking to publicize Democrats’ tax records. The next step would likely be Neal either issuing a subpoena to compel Treasury Secretary Steven Mnuchin to turn over the filings, said Hungar, or the Massachusetts Democrat could go to court seeking an order that the administration hand over the information. The administration has an incentive to stall in hopes that Republicans can retake the House in next year’s elections. 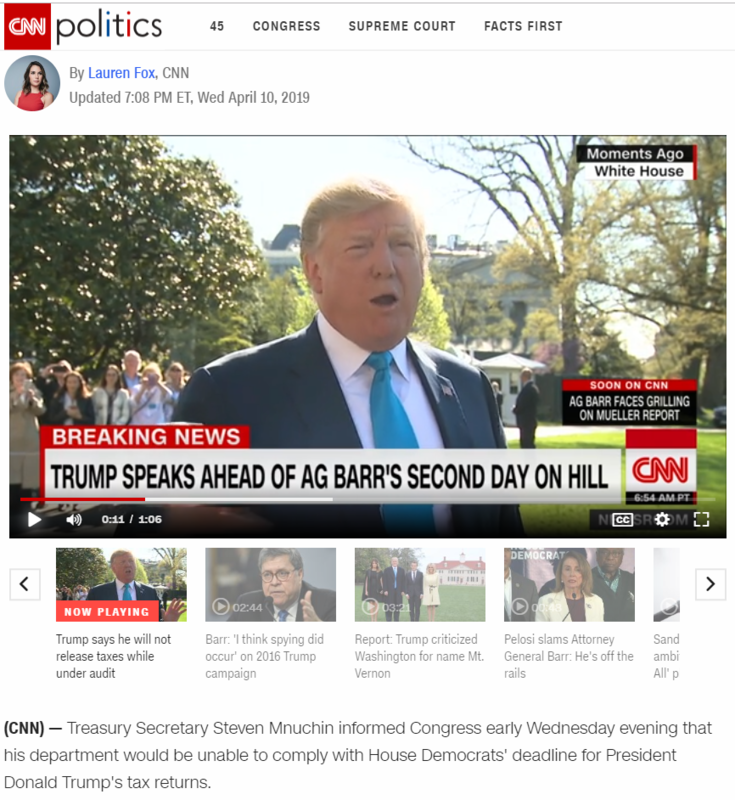 "The Trump administration will consider itself the winner as long as the tax returns aren't turned over before the 2020 elections," said Charles Tiefer, a former acting general counsel for the House who now teaches at the University of Baltimore's law school. "They probably don't want it to be turned over at all, but it matters much less after the 2020 election." He said Neal "absolutely" has a good case: "The statute says the Treasury secretary quote shall unquote turn over the files — it couldn't be any more emphatically clear if it was tattooed on Mnuchin." Trump has defied, ever since he first began running for president, a decades-old tradition in which presidents and White House contenders have voluntarily released their tax returns. In recent days, as Neal's April 10 deadline began to loom, Trump's aides made clear he had no intention of giving up his returns. Last edited by Tennis & Golf Nut; 04-10-2019 at 07:52 PM. Poor pencil neck !! Maybe his husband will make him feel better tonight. Why do they want his tax returns ? Is there a law that says Presidents have to disclose them ? I don't think so. It's a fishing expedition. Madcow made a big deal out of a tax return showing he paid over 20 million one year. It wouldn't matter how little or how much he paid, they'll politicize it. Go Trump - - - WINNING . . . This will bring the Gloves out. My money's on Trump Ali! And if they can't find anything in his Tax records they'll go after something else. The next Libtard who wins POTUS should be destroyed by the Republicans. Libtards must be foaming at the mouth. Trump always has the same answer to the Libtards **** YOU! After being asshammered at every sneakyshit trick they've tried for over 2 years they don't have the ability to see that far into the future. Last edited by nitronick; 04-10-2019 at 09:54 PM. if they can demand Trumps returns can we FOIA Piglosi and Chucky and Crazy eyes ocasio's?